Los Afro-Latino’s mission is to bring our readers closer to the people, places, events and movements that impact the Afro-Latino Diaspora. Periodically, we will enlarge the tent, sharing stories of the Great African Diaspora, whatever the topic, whatever the issue, whatever the cause to inspire and to enlighten. Our inaugural post covering the Great African Diaspora took me to South Carolina’s Low Country this past August, a pilgrimage to the heart of Gullah Culture. It was a late summer visit to Hilton Head Island – a 12 mile long and 5 mile wide barrier island along the Atlantic Coast. The Gullahs trace their ancestry to enslaved Africans, forcibly brought to the eastern Atlantic seacoast from present day Angola and Sierra Leone, West Africa. Spreading across nearly 500 miles, from Cape Fear, North Carolina in the north to Jacksonville, Florida in the south, Gullahs were enslaved along the Atlantic coast. They were highly skilled and knowledgeable farmers with an expertise in rice cultivation. It was these competencies that made them ideal labor to toil the rice, cotton, sugar cane and indigo plantations of the Sea Islands. Today, the Gullah population is concentrated in the coastal region of South Carolina and Georgia. Geographically, the area represents the quintessential old South with Spanish moss draping from centuries old oak trees, picturesque antebellum plantations and homes. All of this is punctuated with the slow sway of the Islanders’ drawls and warmly exchanged salutations. The tight knit Gullah population, with four centuries of existence on Hilton Head, lived in a spirit of community—taking care of the group and the individual—promoting and supporting self reliance. The Gullahs are the oldest surviving African based culture in the United States. They are credited with being the first freed Africans owning land, establishing free public schools and founding the first African free village. A combination of factors including Hilton Head’s physical remoteness, low elevation and a malaria outbreak prompted the majority of Europeans to flee the island for more comfortable living on the mainland. For the Gullahs these isolating conditions strengthened their community and preserved their language, traditions, religion, herbal medicine, music, storytelling and cuisine, safeguarding their cultural bond to Africa, their homeland. In 1956, a crucial change took place on the Island when the James F. Byrnes Bridge, a two-lane toll swing bridge opened Hilton Head to automobile traffic. Along with the bridge’s opening came housing development and tourism. Twenty-six years later, 1982, a larger highway construction project was completed. This time it was the opening of a 4 lane highway, bringing increased development and tourism. Reflecting on the bridge and highway construction’s impact on island living, many Gullahs credit these two transportation projects with the profound emigration of the community from Hilton Head Island. Yet, despite these shifts the Gullah community is committed to preserving its heritage and sharing it through island tours, arts and crafts, quilting, music and the annual Gullah Festival in Beaufort, South Carolina. And of course, sharing Gullah culture would be incomplete without sampling its cuisine which uses rice as a premiere component, one pot meals and an array of seafood dishes at Low Country restaurants on Hilton Head and the mainland, particularly in Charleston, South Carolina. 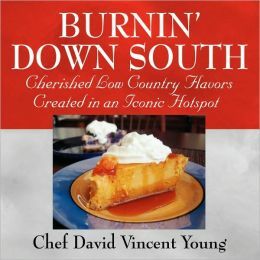 Nowadays, any conversation about Hilton Head’s Low Country Gullah cuisine includes talk about native son Chef David Young, who graduated with a culinary degree from Madison Area Technical College, Madison, Wisconsin. His popular restaurant, Chef David’s Roastfish and Cornbread is located on the island’s south end at 70 Marshland Road, specializing in revered rice dishes, seafood and vegetarian (vegan) food. Chef David’s ancestors have been living on the island for 175 years. Now, nearly two centuries later, Chef David is one of the island’s hottest chefs. His star is steadily rising. He began his voyage into gastronomy at age six, guided by his Gullah great-grandmother, Mary Cohen, who prepared food by memory. For David, her repertoire for Gullah cooking was built on aromas, flavors and tastes. While Mary Cohen’s recipes were never written, her great- grandson’s 2008 cookbook, Burnin Down South is a compilation of Low Country recipes featuring savory dishes like red rice, She Crab Soup and collard greens. A big part of Gullah cuisine means taking advantage of nature’s bounty and the abundant seafood of the nearby waters. Seafood has played an integral role in island life. Shrimp burgers, made of ground shrimp and seasoned with herbs and spices on wheat bread, are one of the restaurant’s most requested offerings. Chef David making shrimp burger. While he’s not a vegetarian, Chef David is building a reputation on the island as one of the few proprietors to include an extensive variety of vegetarian (vegan) dishes on the menu. Chef David’s riff on the quintessential New Orleans Po-Boy, a sandwich filled with roast beef, dripping with gravy on French bread, is a vegetarian delight. 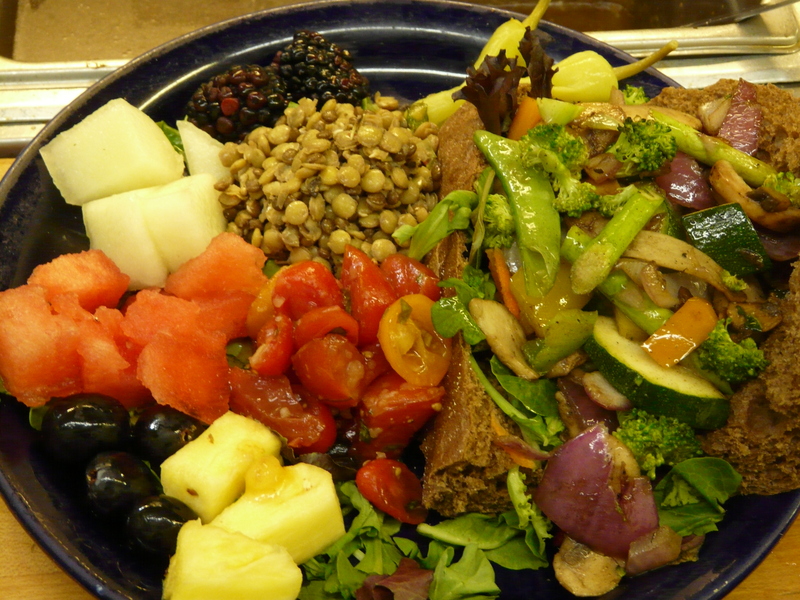 It’s loaded with lentils, sautéed and chopped baby bella mushrooms, onions, peppers, asparagus, broccoli, topped with acai-pomegranate vinaigrette and served on brown bread. The beautifully presented sandwich is complemented with a riotous explosion of colors and flavors including pineapples, berries and watermelon. Whether vegan, vegetarian, carnivore or locavore, Chef David proudly speaks to the universality of his restaurant, “There is something for everyone here.” Roastfish and Cornbread is dazzling crowds with its steamed chicken, brisket, shrimp burgers and, one of his signature dishes – sweet potato cornbread. Living with Gullah culinary heritage which is older than the United States is a valuable legacy for Chef David. “Our Gullah food is older than this country. We were here before America was a country. It’s the oldest food in this country. We cooked for everybody.” Gullah cuisine is one of the oldest surviving African based cultures in the United States.